Most Eagle Nests Ever Found in Ga.
Peering down from my seat in the back of the helicopter, I scan the trees for a nest of the most iconic raptor in North America – the bald eagle. At this height, however, the landscape is a blur of green and brown and I’m having trouble spotting my target. Finally I see it, my eyes drawn by the telltale white, or “bald,” head of a nesting eagle and two fuzzy eaglets huddled together near the crown of a towering pine. One can’t help but be struck by the sight of this emblematic bird, especially at home in the wild. But such a sight was rare some 40 years ago. Facing near extirpation largely because of pesticides, the once abundant bald eagle had all but disappeared from Georgia. But thanks to vigilant conservation efforts and protection under state and federal laws, the bald eagle has rebounded dramatically. This year, aerial surveys by the DNR Nongame Conservation Section documented 210 occupied nesting territories. That’s a record for the state and includes 20 newly confirmed sites. Of that nest total, 166 produced young, an 11 percent increase from last year, which had also set a new high for the annual surveys. Flying from one nest site to the next during a recent survey, it appears the bald eagle is once again finding in Georgia a place to nest, raise its young and call home. Details on the 2015 surveys, plus photos. The bald eagle comeback could not have happened without your support. One of the most effective ways you can help conserve wildlife and rare plants in our state is through buying or renewing a DNR nongame wildlife license plate. 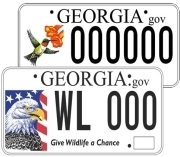 Benefiting Georgia’s native nongame species and their habitats, these tags accounted for 41 percent of revenue to the Georgia Wildlife Conservation Fund last year. The fund supports the Nongame Conservation Section, which leads DNR nongame efforts. Annual report. 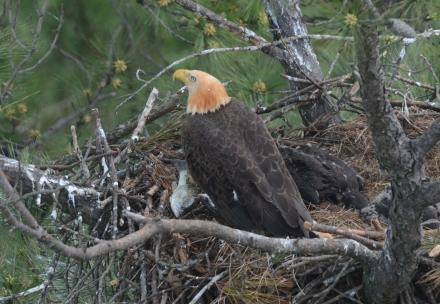 Public reports are a key part of eagle nest monitoring, often leading to previously undocumented nests. For example, while refueling in Dalton during the final aerial survey last month, survey leader Jim Ozier learned of a sighting some 10 miles away. The survey crew flew over the area and spotted the nest – the first time it had been documented! Report nests you see online or by phone (478-994-1438). Just a few years ago, Black Diamond Tunnel was a highlight in our winter bat surveys. 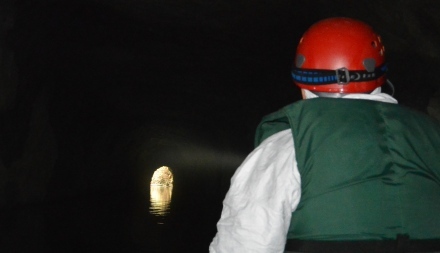 We’d load up a boat – the tunnel is a flooded railroad passage – and drive to Rabun County early in the morning and usually in bitter cold. We would climb the steep drive to the landowner’s house, excited to catch up with Regina about the past year. While we did the survey, she would wait at the tunnel entrance, making sure we returned safely and hoping for good news about the bats that mean so much to her and her family. Last year was the year we had been dreading. We came out of the tunnel with the news that bats in Black Diamond had white-nose syndrome, the disease that has killed more than 5.7 million bats in North America since 2006. The discovery was devastating but not unexpected. White-nose was first documented in Georgia in 2013, and has since spread into every north Georgia site we regularly check. Snow delayed this year’s survey at Black Diamond, and when we finally arrived, we were worried about what we might find. Regina greeted us as always, and even later softened the blow of what we found, offering homemade cookies after our trip into the tunnel. The news we brought was much less sweet. Only two years after the first signs of white-nose in the tunnel, bat numbers there had dropped by 89 percent. Read Trina’s blog about this year’s surveys. Also see photos and cave survey summaries. Iowa recently became the 26th state to confirm the disease in its borders. 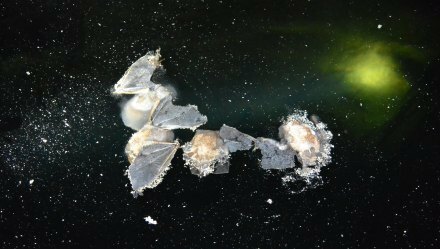 The signing of a letter of intent between Canada, Mexico and the U.S. signals the three nations will cooperate on conservation of the continent’s bats. Coming soon to Georgia Wild: more news about what bats need and how you can help. As expected, April has been a month for the birds. 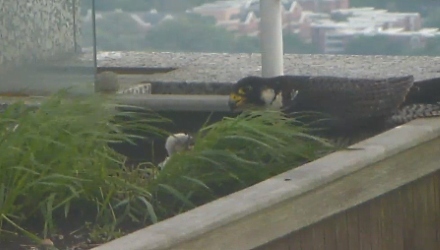 The Atlanta peregrine falcons live-streamed by DNR are caring for eyases. All three of the nest’s eggs hatched last week. Watch this fast-flying family at www.georgiawildlife.com/falconcam. The whimbrel nicknamed Postel is returning to St. Simons Island (“On the trail of whimbrels,” May 31). The shorebird was fitted with a transmitter there in 2012 and has since returned to the same marsh and area roost sites each spring to scarf down fiddler crabs before flying 2,000 miles nonstop to nest near Hudson Bay. It’s part of a 5,400-mile Arctic-to-Brazil migration that Postel, the second-longest tracked whimbrel, makes twice a year. Follow online. The 10th annual Youth Birding Competition starts at 5 p.m. Saturday, April 25. Teams of birders from kindergarteners to high school seniors will scour the state to identify as many bird species as possible by the 5 p.m. Sunday deadline, then enjoy a well-deserved break and awards banquet at Charlie Elliott Wildlife Center. See T-shirt Art Contest winners. Winners in the 25th annual Give Wildlife a Chance Poster Contest were recently announced and will be on display May 5-12 at the State Botanical Garden of Georgia in Athens. 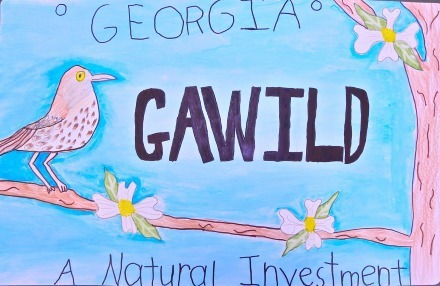 The theme for this year's contest, "Georgia's WILD animals and plants -- a natural investment," involved students depicting a nongame plant or animal on a Georgia license plate, a focus centered on the event's silver anniversary and the reduced pricing for DNR wildlife tags, a key funding source for nongame conservation in Georgia. Top posters. The Mountain Bogs National Wildlife Refuge was officially established this week, becoming America’s 563rd refuge, according to the U.S. Fish and Wildlife Service. The western Carolina refuge is devoted to the conservation of southern Appalachian mountain bogs, one of the rarest and most imperiled habitats in the U.S. Read about DNR's work with mountain bogs in the Nongame Conservation Section annual report. A young-of-year robust redhorse was collected in the lower Ocmulgee River in August, the first ever captured in the Ocmulgee system. The fish shows that some of this rare species are surviving from larval to juvenile stage. Recent sea turtle strandings included four loggerheads and one leatherback hit by boats. Recreational boaters are encouraged to watch for sea turtles on the ocean side of barrier islands and in tidal creeks and sounds. Report sightings of hurt, dead or stranded sea turtles or other marine animals, such as manatees, dolphins and whales, at 800-2-SAVE-ME (800-272-8363). This year’s Georgia General Assembly decided to designate white-tailed deer as the official state mammal and lift restrictions on hunting feral hogs, while requiring a permit to transport live feral hogs. Lawmakers also passed House Resolution 907, which provides ballot language for a constitutional amendment to use 75 percent of current sales tax revenue from outdoor recreation equipment for a proposed Georgia Legacy Trust Fund. The targeted vote would be in fall 2016. The Legacy Trust Fund (House Bill 693, by Rep. Jon Burns, R-Newington) would be dedicated to preserving conservation lands. The bills follow 2014 legislation by Sen. Ross Tolleson (R-Perry) that formed a joint committee to study restructuring the state’s land conservation program and potential funding sources. The Georgia Envirothon State Competition put the environmental knowledge of 12 top-scoring teams to the test late last month in Fort Valley. West Region winners from Rockdale County were photographed (above) as they identified specimens at the wildlife station; however, Appling County High's team took top honors, and will compete in the national championship. Most protected lands in the U.S. are in the West but the majority of at-risk species are in the Southeast, highlighting the need to focus public and private conservation efforts in key areas, according to “U.S. protected lands mismatch biodiversity profiles,” a report in Proceedings of the National Academy of Sciences. An Atlantic spotted dolphin found dead on Cumberland Island April 13 likely died from natural causes, according to preliminary findings. The species is usually found 20 miles or more off the state’s coast, and this marked only the fourth spotted dolphin documented in Georgia since 2000. While North Atlantic right whales that winter on Georgia’s coast have migrated north, NOAA reports that four large recreational yachts were cited this year for violating 10 knots speed limits in Right Whale Seasonal Management Areas along the Atlantic coast. Penalties ranged from $9,000 to $11,500. Remember the young right whale that agencies including DNR partially disentangled from fishing rope (video) in February 2014? Last week, the Center for Coastal Studies spotted right whale No. 4057 free of gear in Cape Cod Bay! Entanglement in commercial fishing gear is a leading threat to these endangered whales. Helicopter flights to find Florida sandhill crane nests in Okefenokee Swamp National Wildlife Refuge documented 11 active nests and 36 adult cranes. Georgia nongame highlights from 2014 are featured in this video recap of the DNR Nongame Conservation Section’s annual report. 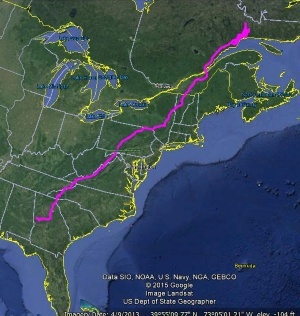 The golden eagle fitted with a transmitter near Thomaston is now cruising the wilds near Sept-Îles, one of the most northeastern Canadian cities connected to Quebec’s road network and some 1,800 miles – by roads – from middle Georgia (map at right). Got brown marmorated stink bugs? UGA entomology professor Paul Guillebeau is asking Georgia homeowners to take this brief survey to help size up the problem posed by the invasive insect. The “orphaned” animal in your yard is probably neither “orphaned” nor in need of rescue. Here’s DNR’s advice on what and what not to do regarding young wildlife. Names in the news: DNR Ranger 1st Class Brian Adams recently received the Rocky Wainwright Waterfowl Office of the Year Award for the second consecutive year, a credit to Adams' work in enforcing waterfowl laws in east Georgia counties and on Clarks Hill Lake. As part of National Volunteer Week, the Natural Resources Conservation Service in Georgia honored Earth Team volunteers Devon Bullock, a UGA student working on soil profile models for the service’s office in Athens, and Marietta Walker, a Leslie resident who helps with customers and contracts in the Americus office. May 2: JAKES Day and fishing rodeo, 8 a.m. start, Miller Creek Lake, Jones County. Monitoring “mice” with wings – Henslow’s sparrows. Turn your yard into a hummingbird haven. Plant conservation experts pondered ways to save the Southeast’s rare plants during a national meeting last week at the State Botanical Garden of Georgia in Athens. 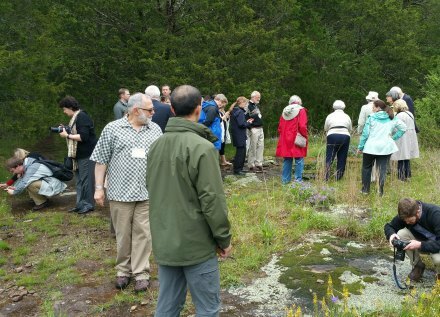 The Center for Plant Conservation, a network of 36 leading U.S. botanical institutions dedicated to preventing the extinction of imperiled native flora, also heard from a promising group with local roots: the Georgia Plant Conservation Alliance. Developed by the State Botanical Garden, the Georgia Plant Conservation Alliance, or GPCA, works to preserve scores of rare plant species in the state, and its safeguarding and in-situ focus represents a new direction for the Center for Plant Conservation. Representatives from six GPCA member organizations, varying from Atlanta Botanical Garden to the DNR Nongame Conservation Section, both charter members, gave presentations to the gathering of conservation professionals from 17 states and 21 partner botanical gardens.